Free Printable April 2015 Calendar. Print Free April 2015 Calendar, good for teachers, students, parents, small business owners, for planning and organizing the month. You have 2 options, calendar starting the week on Monday or Sunday with the previous and next month. 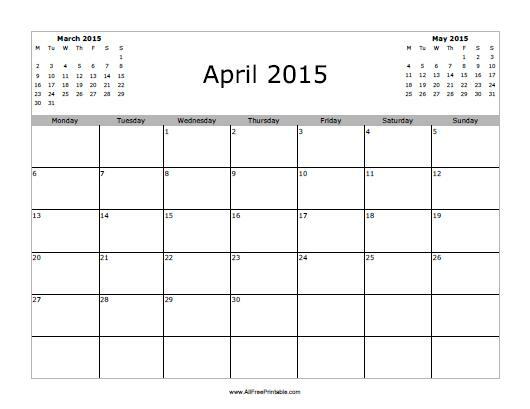 Use our free printable April 2015 calendar to write important things to do on April 2015, Easter Day activities, vacations, favorite tv program, school schedule, anniversary, things to do at home and more. Select the link of your choice to download or print now. April 2015 Calendar is coming up as Not Found. Can we fix this?